Cardiff - A powerless spectator as Wales's World Cup dreams were crushed by the Republic of Ireland, Real Madrid star Gareth Bale has arrived at a crucial tipping point in his career. 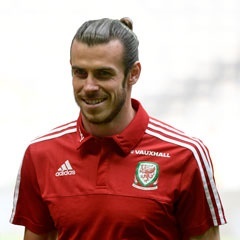 Sidelined by the latest in a succession of calf injuries, Bale could only watch forlornly from the stands at Cardiff City Stadium on Monday as Ireland's 1-0 win gave them a World Cup play-off berth at Wales's expense. Having turned 28 in July, and with his fortunes tied to a country that last qualified for the World Cup in 1958, Bale has missed out on his best chance of playing at football's biggest event. He was the undisputed figurehead of Wales's successful qualifying campaign for Euro 2016 and then starred with three goals as Chris Coleman's side confounded every expectation by reaching the semi-finals in France. But his injury woes have obliged other players to step up in recent months, with 17-year-old Liverpool forward Ben Woodburn and Derby County's Tom Lawrence among the unlikely players to have answered the Welsh call. The loss to Ireland leaves Bale and the other members of Wales's "Golden Generation" contemplating the demotivating thought that Euro 2016 may have been as good as it will ever get for them. Bale can at least console himself that once he has recovered from his latest injury, his place in Coleman's starting XI will be waiting for him, but the same cannot be said at Madrid. With three Champions League triumphs in the past four seasons, Bale is already arguably Britain's most successful footballing export, and yet he is under greater pressure at the Bernabeu than ever before. Isco exploited an ankle injury sustained by Bale to move ahead of the Welshman in the pecking order last season and 21-year-old Marco Asensio's emergence as the new darling of Spanish football has further complicated matters. Bale managed just 19 league appearances last season as Zinedine Zidane's men streaked to the Spanish league title and has started only four times in the league in the current campaign. In a snapshot of his difficulties, he scored a sublime volley on his last outing as Madrid won 3-1 at Borussia Dortmund in the Champions League, only to then succumb to the 11th calf injury of his time in Spain. Compounding Bale's situation is his uncomfortable relationship with Madrid's fans. He became a firm favourite after his world-record move from Tottenham Hotspur in 2013, his goals in the Copa del Rey and Champions League finals helping him to engrave his name in Madrid folklore in his very first campaign. But he has since become a target of the Bernabeu boo boys, who believe he has benefited from favouritism and reproach him for his failure to learn Spanish. "Bale is beginning his fifth year at Madrid and he still finds it very difficult to express himself in Spanish," the former Madrid striker and coach Jorge Valdano said earlier this season. "Football is a game of mutual understanding. Isolation in the dressing room also becomes isolation within the team. "There is a big connection between how you adapt socially and how you adapt on the pitch. And you must also say that very few players have had the support, from both the institution and the coaches, that Bale has had." Bale has received public backing from Zidane and his team-mates and is known to be a favourite of Madrid president Florentino Perez's. But he continues to be linked with a return to England with Manchester United and having seen Wales's fairytale three-year journey come to an end, he now finds himself at a crossroads.